* Provides a well balanced nutritional package providing basic nutrition without offering color enhancement or superior growth characteristics. 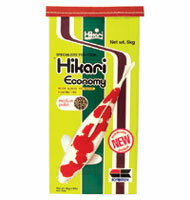 * Offers the consumer excellent value for their money, yet provides adequate nutrition to keep their koi healthy. * Advanced production technology allows us to provide you with a food that will not stain or cloud your pond water. * Floating foods allow you to easily monitor and adjust the amount of food fed to avoid over-feeding.